In light of China's deepening economic slowdown, "China's foreign policy may well be driven increasingly by the risk of domestic political instability," write Robert D. Blackwill, Henry A. Kissinger senior fellow at the Council on Foreign Relations (CFR), and Kurt M. Campbell, the Asia Group's chairman and chief executive officer, in a new Council Special Report. "Economic growth and nationalism have for decades been the two founts of legitimacy for the Communist Party, and as the former wanes, [Chinese leader Xi Jinping] will likely rely increasingly on the latter." Xi's "dominance of the decision-making process [has] made him a powerful but potentially exposed leader," the authors note. To protect his position, Xi will "most probably stimulate and intensify Chinese nationalism—long a pillar of the state's legitimacy—to compensate for the political harm of a slower economy, to distract the public, to halt rivals who might use nationalist criticisms against him, and to burnish his own image." 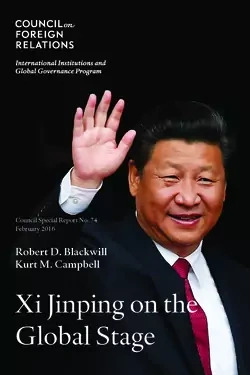 The report—Xi Jinping on the Global Stage: Chinese Foreign Policy Under a Powerful but Exposed Leader—notes that China's economy, which had expanded at an annual rate of 10 percent for three decades, is entering a new era of considerably slower growth. To strengthen his position at home, Xi "will probably intensify his personality cult, crack down even harder on dissent, and grow bolder in using the anticorruption campaign against elites who oppose him." Internationally, Xi "may provoke disputes with neighbors, use increasingly strident rhetoric in defense of China's national interests, and take a tougher line in relations with the United States and its allies to shift public focus away from economic troubles." To deal with Xi's more assertive foreign and defense policies, the authors call for a new American grand strategy for Asia that "seeks to avoid a U.S.-China confrontation and maintain U.S. primacy in Asia." The authors, both former senior government officials with extensive experience in the region, recommend passing the Trans-Pacific Partnership—an Asia-centered trade deal with countries that represent approximately 40 percent of the global economy—lifting constraints on U.S. exports of oil to Asian allies, and maintaining a commitment to deploy at least 60 percent of the U.S. Navy and Air Force in the Asia Pacific. They identify the U.S. pivot or rebalance to Asia as "the indispensable ingredient in a successful U.S. policy to participate and project strength more consequentially in the region and to deal with Chinese power and influence under Xi Jinping." To interview the authors, please contact Global Communications and Media Relations at communications@cfr.org or 212.434.9888.